I'm not very talented when it comes to working with image editors. I handle basic tasks well, for instance blurring information on screenshots or cropping images, but everything beyond that is just not something that I'm good at or can do at all. With that out of the way, lets take a look at what Gimp 2.8 brings to the table. I first of all need to mention that Gimp 2.8's source code has been released right now,but not the binary versions of the image editor. It basically means that both Windows and Mac users need to wait until the binaries of Gimp 2.8 are released before they can upgrade their versions of the application, or install the image editor on their computer systems. Probably the biggest change in the new Gimp version is the single-window mode, which attaches all the smaller editor windows to the primary window. Gimp's default multi-window mode displays editing options in their own window, which sometimes had the effect that resizing the screen or moving elements around hid some of those boxes, and that you had to search for them for a while before you got them back on the screen. The Windows > Single-window mode checkbox handles if Gimp runs in single- or multi-window mode. Another important change, at least for users working with layers in the program, is the new grouping option. Users can now organize layers into groups, which are then displayed in a tree-like structure in the application. Gimp 2.8 furthermore introduces on-canvas text editing, making the process work more like it does in other image editors. Gimp users not only get to customize the texts font family, style and size, but also control over baseline offset and kerning of the text. 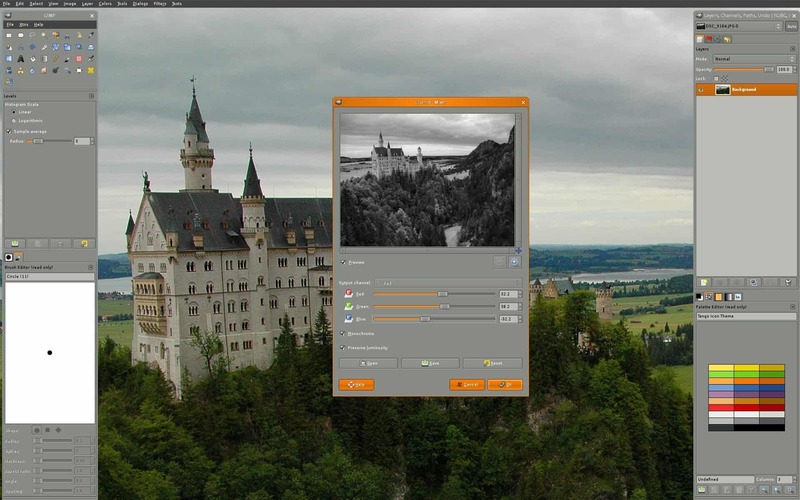 Differentiation between saving and exporting images. Saving basically allows you to save the image in one of the supported image formats, like png or jpg for instance, while exporting saves the current work done instead in a native Gimp format. The latter allows you to continue working on the image when you load it the next time. Update: As a reader has pointed out, it is exactly the other way round. Layer Groups. Please note that the team has made additional changes to layers in the program. This includes alt-clicking to create a selection from a layer dialog right away. Keyboard Shortcut changes (Ctrl-E and Ctrl-Shift-E are not reserved for the programs image importing mechanism, which means that the Shrink Wrap and Fit in Window shortcuts have been remapped to Ctrl-J and Ctrl-Shift-J. You find the source code of Gimp 2.8 already listed on the official download page on the website. Windows and Mac users need to wait a bit longer until the final versions for their operating systems are compiled and made available on the same download page. It took the developers several years to get Gimp 2.8 realized. The new version introduces several interesting changes to the image editor that make it more appealing both for inexperienced users as well as experienced users. The single-window mode interface or the new on-canvas editing options are something that especially inexperienced users will like, while experienced users may select layer groups as the most exciting feature of the new version. I can’t wait to try v2.8 out once the Windows installer is up! Sometimes it installs. Sometimes it doesn’t. Actually, it’s exactly the opposite!… “Save” only saves images in GIMP native format (XCF). If you want to save in JPG or PNG, you have to “Export”. Thanks for letting me know about it, corrected!